There are a lot of things that can go right when giving birth in a hospital setting. We often hear stories from parents about how accommodating staff was of their needs and wishes, how supportive and helpful their nurses were during labor, and what a great experience they had in the postpartum unit before going home. But unfortunately things don’t always go that way (even if parents and baby alike are healthy). If you experienced difficulties with your care at a hospital during labor or during your postpartum stay, we first want to say we’re so sorry. You deserved better. Your family deserved better. You are not crazy for feeling the way you feel (whether that’s numbness, rage, grief, sadness, or anything else). Your feelings are valid. Next, we want to share that there are things you can do to report your experience if you so choose. This process can feel daunting when also taking care of a newborn, so we hope this blog post can make it a little easier for you to understand your options if you want to report your experience. Simply put, there is no reason for anything to change unless women are putting pressure on the system to change. For many years now, women have not been complaining about what happened to them and their babies in childbirth. We believe it’s time to break the silence and break the cycle. For some women, pursuing complaints and receiving an apology or helping to implement a hospital policy change is part of their own healing processes. Women have reported relief and a feeling of empowerment in speaking out about their treatment. 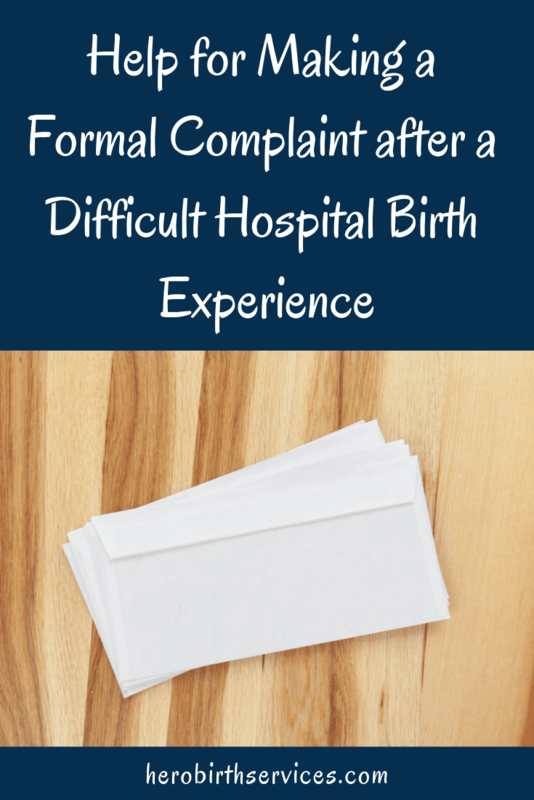 If you feel that reporting your experience may be a helpful piece of your healing journey after a difficult birth and/or postpartum experience, read on. What “counts” as something you can make an official complaint about? Bottom line: Anything care providers and hospital staff said, did, or didn’t do that made you feel unheard, disrespected, invalidated, coerced, ignored, neglected, abused, violated, shamed, blamed, unsafe, etc. This applies to care and treatment of you and your baby. If you want to learn more about human and legal rights in childbirth, we highly recommend Birth Monopoly’s Know Your Rights course created by lawyer and birth rights advocate Cristen Pascucci. This course is an amazing resource for consumers, doulas, and birth advocates to learn about the complicated (and not so complicated) aspects around the rights someone has when they are pregnant and giving birth. Sometimes the aspects of a parents’ hospital experience that they’re upset about directly violated their rights. Other times, it’s less clear. But either way, parents can make their complaints about their care known if they so choose. A note: It’s common for parents to have thoughts like, “Well, my story isn’t that bad,” or “I’m sure other people have had it worse.” We encourage you to consider reporting your experience even if you feel that it could have been worse. Change towards more respectful maternity care won’t happen if hospitals and health care providers don’t hear from consumers who are unsatisfied with their experiences, even if they weren’t worst case scenarios (which hospitals and providers definitely should hear about). So what can you do if you experienced less-than-ideal (or worse) treatment at a hospital when you gave birth? Write a letter to key administrators at the hospital about your experience. This can be done via mail or email. For help formulating your letter, we highly recommend reading Improving Birth’s Accountability Toolkit. To help you get started, you may also want to take a look at this template by birth rights lawyer Hermine Hayes-Klein, this template we developed to help our clients (based on Hermine Hayes-Klein’s template), and this form which is more focused on birth-friendly hospital policies. Share your story with your local birth community. If you worked with a doula, childbirth educator outside of the hospital setting, or other member of the local birth community, you can write to them and share your experience. It’s important to many birth professionals, ourselves included, to hear these kinds of stories (especially if they concern a hospital and/or provider that is often recommended). That way, we have more context when talking with other families about their options for where to give birth and how to find a safe and supportive care provider. Consider taking legal action against the hospital and/or specific care providers involved in your experience. You can consult with birth rights lawyers like Cristen Pascucci or Hermine Hayes-Klein if this is a path you want to investigate further. What happens when someone reports their negative experience to a hospital? Possibly nothing at all. Hospitals aren’t legally obligated to respond to letters like this. If you really want a response, you may need to be proactive about following up in the weeks after contacting the hospital. However, most of our clients who have reported negative experiences to their hospitals in Orange County have received a response. Usually it comes in the form of a phone call from one or more of the recipients of their letter. Sometimes the hospital offers a conference call or meeting with key players who are in a position to make changes based on consumer feedback. In these conversations, usually the hospital administrators ask more questions about what happened and offer some type of apology or other token (often hospitals will offer a free massage or gift card of some kind as part of their customer service strategy in situations like this). Whether or not parents feel comfortable having these phone calls and/or meetings is a very personal decision. Caring for a baby can be a very taxing, vulnerable time of life (especially after a difficult or traumatic birth or postpartum experience) and not everyone feels up for having these types of conversations in the newborn period. Some parents like to ask if they can get back in touch with the people from the hospital who responded to them at a later date when they feel more able to communicate their thoughts. For some people, participating in these types of conversations with hospital staff and reliving their story can be very triggering. We always encourage our clients to put their own health and well-being first before advocacy work that might help to bring change for other families. Perhaps most importantly, if you experienced a difficult or traumatic birth/postpartum stay in a hospital, we encourage you to prioritize your well-being. As we mentioned above, sometimes parents feel guilt around putting off reporting their experience while they are in the trenches of life with a newborn. If that’s you, please try to let yourself off the hook! Early parenthood can be demanding, overwhelming, and just plain hard. You can always come back to the reporting process at a later time if you aren’t feeling up for it, if it’s too painful to think about at the moment, or if you just don’t have enough time. Therapy. If you don’t already have an established relationship with a therapist, this could be a helpful time to find someone. You can use websites like Psychology Today to find a therapist near you, or feel free to reach out to us for some recommendations if you’re local to Orange County. If you are dealing with the effects of trauma after this experience, you might consider looking for someone who practices EMDR. A note here: not all therapists are skilled in dealing with situations revolving around pregnancy, birth, and early parenthood. It may take a few tries to find someone who is a good fit for addressing whatever it is you feel you need to work on as a new parent who went through a difficult birth experience. A Birth Story Listening session. This is a gentle, guided, non-clinical session with a compassionate birth worker to help parents begin to find healing after a challenging birth and/or postpartum experience. Many parents find that a birth story session is a helpful addition to other therapies they may be using (it’s not a replacement for therapy, medication, or working with a clinical professional). Megan offers this service for clients who didn’t use Hero Birth Services for birth support. There are other practitioners in Orange County as well, including Brandy Ferner, Melanie Smith, and Nicole Green. If you live outside of Orange County, there are also distance options including Brandy Ferner and Nikki Shaheed. Consider working with a postpartum doula who is trauma-informed. Not all postpartum doulas are well-versed in working with families who’ve had difficult birth experiences, so be sure to choose someone who feels really safe for you. Marlee is passionate about providing postpartum support for families who’ve experienced trauma during birth or early postpartum, so please reach out to us if you’re interested in this kind of care. To learn more about what postpartum doulas do, read this blog post. Try to minimize chores and household obligations (unless they are helpful in your own process of recovery and healing). Take your friends, families, neighbors, coworkers, etc. seriously if they offer to help. Sometimes having someone else take care of a meal, some laundry, a little cleaning, taking older kids out of the house for a while, or giving your pets some special attention can give you some space and time for rest, healing, bonding with your newborn, and just plain time to think. If you want to report your experience but you want a little help, reach out to us. We’re happy to point you in the right direction if you have questions about reporting your experience in Orange County. Long-term change in the state of maternity care is very slow, but each time a parent/consumer reports an unsatisfactory (or worse) experience, we get a little closer to improving care for more parents and babies. If you want our help reading over a letter you wrote, helping you to figure out who to send your letter to, or if you have questions about anything we’ve listed here, send us a note. If we can’t help you, we’ll try to connect you with resources that will be able to assist. We know that filing complaints, reports, and grievances can be time-consuming and emotionally challenging. Thank you for taking this step to help address your own healing process, and to help improve care for other parents and babies who will come after you.